Concerto for Violin #2 in B minor, Op. 7 "La Campanella"
Sonata, Op. 27 #3 in D minor "Ballade"
In the history of the violin, this is the Age of Perlman. He is the most recognized violinist since Heifetz and the greatest of the Galamian pupils. In fact, the future of the violin seems firmly in the grasp of Juilliard – a host of Dorothy DeLay students are poised to succeed Perlman with their own violinistic oligarchy. None seems to stand out, however. There is too much competition for a single person to ascend the throne; the proliferation of recordings and the cultural diminution of classical music assure that individual magnetism will never again hold sway. The recordings (c. 1954 1960) of Michael Rabin transport us to the age of the violin superheros – those days when a program at symphony hall could attract a crowd of devotees. Heifetz was still the acknowledged king, the model of perfection despite his chilly demeanor. Milstein, Stern, and Oistrahk were at their shining best. And consumers bought recordings because they carried the artist's imprimatur, not the SPARS code DDD. In Samuel Appelbaum's book The Way They Play (Paganiniana Publications, Inc. 1975), there is a photo of Michael Rabin in his bathrobe. He stands before a folding, chrome music stand, holding his Guarnerius del Gesu in his left hand and a mug of coffee in his right. Rabin's head is inclined towards the music – his warm-up exercises apparently. In the left of the photo, the hallway that adjoins the practice room extends into the distance. where a female figure, in similar dishabille, retreats into shadow. On other pages we have pictures of the violinist with his prized model collection and looking under the hood of his car (he was an avid mechanic). For a book that focuses on "the way they play," it is strange to see Rabin in every guise except that of a violinist. When that interview was conducted, Rabin's concert career was over and the rest of his life was unraveling. The commitments that ensued with his prodigal launch as a teenage virtuoso had been too much for him to handle; he turned to drugs to cope with the anxieties. The coroner found barbiturates in Rabin's blood after the violinist was found dead in his apartment. He had slipped on a rug and struck his head on a table. 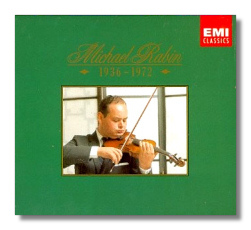 I first heard Michael Rabin in his recording of the Paganini Caprices. A college friend had introduced me to the artistry of Itzhak Perlman, and I was interested in pursuing this music of transcendental technique. In the music library there was a two-record set of the Caprices played by this Rabin chap. The cover showed a young man, already balding, glowering down his instrument as if he had been interrupted. When I put on the old LP and Rabin lit into the first caprice, I felt an influx of adrenaline. The playing had overwhelming verve. His tone, while not as buttery as Perlman's, was fiercely dramatic. The close-up recording made him sound even over-emphatic. I will never forget the final trill of 24th caprice, a superb flourish to cap one of the best virtuoso recordings of all time. Thereafter, I paid a visits to the record archives, the Tower Records cut-out bins – anywhere I thought I might make contact with his spirit. Named by famed Juilliard pedagogue Ivan Galamian as his most talented student ever, Rabin set out to play this violin like Heifetz – every performance a hurricane of effortless technique and burnished tone. For a while, the daunting standard seemed achievable. At age ten he essayed the fearsome Wieniawski First Concerto; a few years later his Carnegie Hall debut featured the Vieuxtemps Concerto #5 in A minor, a Heifetz specialty. World-wide tours followed. The teenage Rabin recorded the violin part for the soundtrack of Rhapsody, starring Elizabeth Taylor and Vittorio Gassman in a forgettable musical intrigue. He also made his first Paganini recording, a selection of Caprices. From there the invitations to record burgeoned. Virtuoso music was the focus: the two Wieniawski concertos, the Scottish Fantasy of Bruch, and the Glazounov concerto. And of course, there was Paganini. Rabin twice recorded the First Concerto. That version, in mono, is more faithful to the concerto as an organic whole; he and conductor Galliera keep the phrasing witty and lithe. The second, recorded shortly after his twenty-fourth birthday, shows Rabin in a more assertive pose: his tone, now in stereo, simply blazes. The original Capitol LP coupled the Paganini with Wieniawski's 2nd Concerto, and as long as I have listened, neither of these recordings has been surpassed. Blessed with a fabulous natural technique and a melancholic temperament, Rabin's art is essentially at odds with itself. His conquests of showy concertos and encore pieces, with their "play to the crowd" demands, sometimes lack character. The "Zapateado" sounds a bit steely next to Perlman's suave take. In the Mendelssohn, Rabin also seems ill at ease: tempos too drawn out, his tone almost monochromatic in its relentless intensity. Surprisingly, some of the more delicate duos for piano and violin come off extremely well. "Sea-Shell" by Carl Engel showcases Rabin's amazing trill, fluttering from register to register with perfect control. He is also capable of great repose in Thais "Meditation." The Kreisler pieces have a ravishing sound, but border on schlock (Wilhelmji's transcription of the Chopin Nocturne is cloying in the extreme). The music for solo violin benefits from Rabin's concentrated approach: His Ysaÿe, if not the last word in interpretive imagination, is nicely judged. Rabin surmounts the technical hurdles without making light of them. Despite his childhood avowal to play just like Heifetz, Rabin never embarks on a performance as a stunt. His phrasing, his effulgent tone, and his flair for the dramatic save him from empty virtuosity. On the balance, this EMI set is extraordinary. The concerti are studded with moments that would be the centerpiece of many a career. For some, though, enthusiasm will be tempered by the in-your-face sonics. EMI was late getting to stereo, and their master tapes aren't in the best of shape. You can obtain a separate disc of the Caprices (now available in stereo again!). If you can't find the whole set, the least you can do is to spring for the Caprices, an enduring testament to a marvelous talent.